I blend my experience of a 20-year corporate career in leading product design, design thinking, emotional intelligence and innovation with effective experiential work with horses to help clients gain awareness and grow in the areas of authentic leadership, communication, culture-building, emotional intelligence, innovation and creativity. 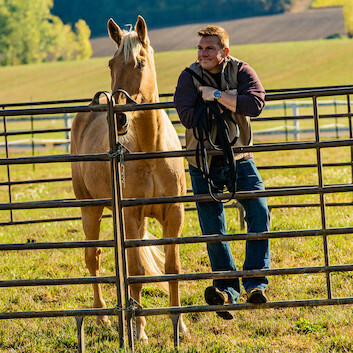 In the fall of 2016, I was honored to be able to experience a private all day Equus Coaching session with Koelle Simpson that was transformational and nothing short of magic. In 2018, I founded Pathfindr Coaching® and now work out of the Dallas Equestrian Center heading up the workshop program and developing programs for individuals and corporate clients. I hold a BS in Psychology from Georgia State University and I’ve completed leadership-training programs at The Center For Creative Leadership. My hope is to continue to serve others on their own path of expansion, healing, transformation and growth. Please reach out to collaborate or to just say hello at daryle@pathfindrcoaching.com.